Mike: Jossy, DIARIO published an article today that describes an encounter an American tourist had with a rather boisterous woman in Aruba. A translation is provided on the Scared Monkeys blog. What are your personal feelings about that exchange? Jossy: My personal feelings on the matter at Baby Beach are that they should come down hard on that woman. She has absolutely no right to speak insultingly to tourists, or Arubans for that matter. And steps should be taken to curb similar incidents in the future. That woman had no right and no cause to speak in that tone to the American resident or to the tourists in that way. Mike: Would you say this is an isolated incident? Jossy: It is not an isolated incident, but it is not prevalent on the island either. Most Arubans, and I mean MOST like Americans and the U.S. We don't have that sentiment, rampant in Latin America, of "Yankee go home". On the contrary, there is a lot of respect here for America and Americans. Mike: Has the Natalee Holloway case brought about this disgusting trend that is harmful to both the tourist and the image of Aruba? Jossy: Aruba has a foreign element that has established itself on the island in big numbers, and we are facing exactly the same problems that the U.S. is facing with the illegals. And please note the distinction that I do not refer to them as "immigrants", because an immigrant is someone who enters a country legally, via airports or docks, with their papers in order. Can't anyone make those people see that an illegal person is not an immigrant? That he or she is in conflict with the law, that he or she has absolutely no rights except those accorded to individuals as human beings. The illegal situation in Aruba is comparable, pro-rated to population of course, to that in the U.S. In my mind, if you are illegally in a country, you are there against the law, and the law should be applied with full force in order to protect the rights of the people who are there legally. The illegal element in Aruba has caused a lot of damage to the island's culture, traditions and social atmosphere, and has boosted the crime rate to higher levels. Mike: It is clear that you have some serious questions about the status of this woman that verbally attacked the American expatriate and his tourist friends. Ignorance comes in all shapes and sizes. Hopefully, this will gain the attention it deserves from the Aruban authorities. 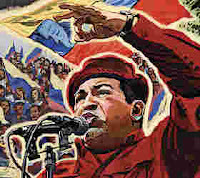 Another item that has been circulating about the Internet is your association with Hugo Chavez. A rather old article was scanned and posted on a few blogs that puts you and Chavez together several years ago. Are you aware of that? Jossy: As I have told you in the past, I never read the blogs, or other things on the Internet, because anyone can say anything without restriction. Mike: Let me send you a copy of the message and the scanned article. Then I would like to get your reaction. Jossy: Okay, However, I pay little attention to the Internet and what people say on it, at least about me. I just don't have the time to waste with nonsense! Mike: Now, do you recall the article? Jossy: That was almost ten years ago, when he was inducted by the then democratic President, Rafael Caldera. That photo was posted by the mediocrities in the Aruban government. They have tried by every means to discredit me because I criticize their stupidities and lack of leadership. Now, they want to direct their attentions to Chavez, whom I once invited to come to Aruba. I first met Chavez when he was released from prison way before he became a candidate for the Presidency of Venezuela. I have not met him since, and haven't spoken to him on the phone or via any other means in more than 8 years. However, I have criticized him in my paper and will continue to do so as long as he continues his dictatorship and his uncalled for attacks on the U.S.
Mike: Hugo Chavez strikes fear in many American hearts, because of his extreme fa naticism. Many of us view him as a dangerous man, traveling down a familiar road. Promises are made to those most desperate in order to gain control and then the tyranny begins. It is a sad, predictable path. Jossy: My opinions in no way differ from your own on Chavez and the fear he inspires. I published an editorial on February 27, 2007 http://www.diarioaruba.com/2007/3/1/ about my friendship with him in the past, including my total rejection of his political ideology and his attacks on Bush and the U.S. How do people expect me to sustain a dictator who would, if he ever got the chance, to silence the press in Aruba? Political stupidity in Aruba runs very high, and the slander campaigns (inspired and conducted by R. Delila!) continue. Mike: Jossy, thank you for giving me this time and explaining your point of view about these recent issues. You are a shining light for those of us that want some insight into the workings of Aruba. Before I let you go, I have to ask one more question. Is there anything new going on with the Natalee Holloway investigation? Jossy: Nothing is going on with the Holloway case. I fear that the Dutch team just came to pick up the evidence, take it to Holland and file it. That's what it looks like now. I hope I'm wrong, but it sure seems so. Though, I am in contact with someone who has volunteered some information that we don't have. I hope he comes through and produces some kind of revelation that will bring us closer to solving the case. Thanks Easy. Great interview with Jossy. He is a decent and compassionate man...I always read with interest what you both have to say...Keep up the good work! Hmm my previous post did not got through. Thanks Easy and Jossy for a great interview. Great questions as well as well thought out answers from Jossy. I hope he is right and someone comes through with something on Natalee. Jossy is a decent man with a heart of gold. I sincerely appreciate his willingness to share information with all of us interested in what is going on in Aruba. The only people that think Jossy is a good and decent man and has helped this case are people that do not live in Aruba! Do you know anything about Jossy Mansur besides what you have chosen to read on the internet? Are you from Aruba and vacationing in Pennsylvania at this time? Many of us would like to know how you have gained so much knowledge about the man. Fantastic interview Mike. I am very impressed with your writing style. "Easywriter" suits you well. I assume you must write professionally, but did not see it on your profile. I wish I could read your published work- if such a thing exists. If you have not been published, I hope you are pursuing that. Sorry, but you made some generalizations that I do not care to read. It's about time you people read the book on this "decent" and "conpassionate" Jossy, written by Mr. Olivier. It will change all your views on this Jossy.